We met at the 2006 NOLOSE conference in upstate New York, where we had a one-night stand that eventually turned into a long-distance relationship because she was in Ithaca, NY and I was in Los Angeles. I had the chance to live with her for 6 months in Ithaca doing research at Cornell in the fall of 2007, and then we spent another 6 months apart when I had to go back to LA in spring 2008. We've been living together as of May 2008, first in LA and now in Portland, OR, where we are both finishing up grad school - she is in her second year of an MSW program in Portland and I am in my last year of a PhD program based in LA (I'm writing my dissertation on fat and lesbian visual representation over the past 40 years). We were officially domestically partnered in June 2009 in Oregon. I think that one of the reasons we have made all the stages in our relationship work is because we value a lot of the same social and political issues, including fat and queer activism. I think one of the best ways of meeting people, whether for romantic relationships or not, is by going to events that are about common interests - that way you always have something to talk about, and&bsp; an actual connection can potentially be made, instead of something only superficial. Anyway, enough preaching. 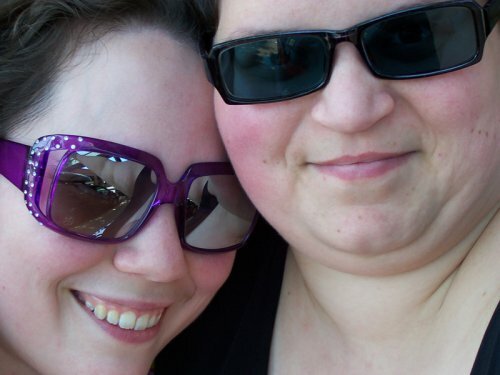 Basically, we make it work because things like fat-positive and queer-positive representation is really important to us both, because we are both homebodies by default, and because we both love to cook and eat and garden and watch tv. Its the basic everyday stuff and the big major life issues that unite us; otherwise, in terms of personality, we are so very different. That's what makes it challenging and fun also, and not simply boring.